all haunt inside our little home. Inside the attic, sixty scream. In walls, in halls, a hundred roam. Two dozen hide inside my room. In closets there are thirty more. above our heads, and ‘neath floor. 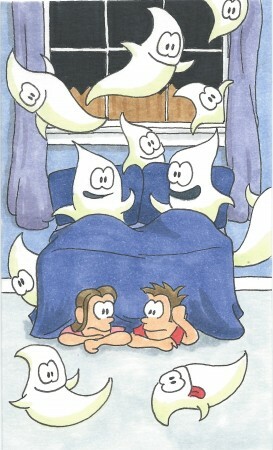 you’ll see at least three ghosts have camped. are fifty more all tightly cramped. there’s no more room for us inside.